Irish racing is full of great characters and one of those will be fondly remembered at Listowel today with the feature Lartigue Hurdle being run in memory of the late Liam Healy. The biggest four-year-old hurdle of the season so far is fully subscribed with 18 runners and Jessica Harrington's Rovetta can continue her rise this summer. Unheralded when winning at Galway as a 33/1 chance the daughter of So You Think then went on to win on the flat a few days later at Ballybrit. 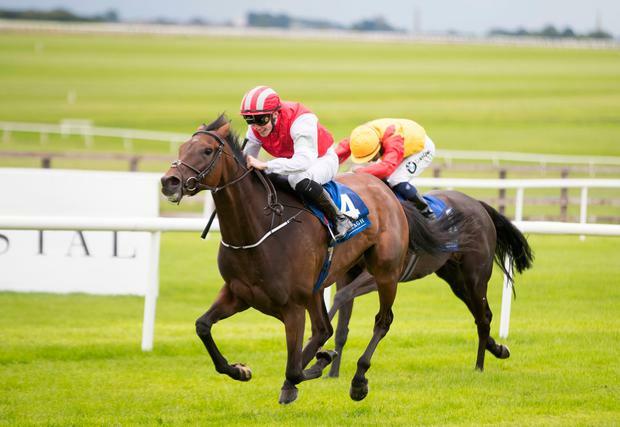 Robbie Power will be getting down to near his minimum weight for this time of year to ride Rovetta for the Capel Street Syndicate which includes Irish rugby international Sean O'Brien. Following her third win on the bounce at the Curragh last month there is every chance she'll make it four in-a-row today. The race includes Cheltenham's Fred Winter Hurdle winner Veneer Of Charm who returns for Gordon Elliott and that is testament to how strong a renewal this year's Lartigue Hurdle is but with a light weight the vastly improving Rovetta is worth sticking with. Another Galway winner lining up today is the Willie Mullins-trained Diamond Hill. A narrow winner of the amateur riders maiden at Galway under Patrick Mullins, Diamond Hill was worthy of much more of her winning margin that day as she met a lot of trouble in running and she should be able to open her account in this Jet O'Carroll Memorial Mares Maiden Hurdle. Paul Townend rides Diamond Hill and the former champion jockey started the meeting here with a four timer on Sunday and he might well have a brace today. Ted Walsh has booked Townend for Minnie Dahill and back over hurdles she looks to have a solid chance. Townend's sister, Jody, won on Minnie Dahill on the flat at Bellewstown and she has been campaigned on the flat since but she was campaigned in good company over hurdles last season and might be well treated off a rating of 111. Capital Force probably hasn't fulfilled on the promise he showed on debut over hurdles a couple of seasons ago and has just won once since so a chance is taken on the much bigger priced Carrig Cathal in the penultimate beginners chase. A highly-rated hurdler Carrig Cathal was well beaten at Galway but might be suited by the more testing conditions today and he did win a novice hurdle at this meeting two years ago so warrants a second look for Stephen Mahon.